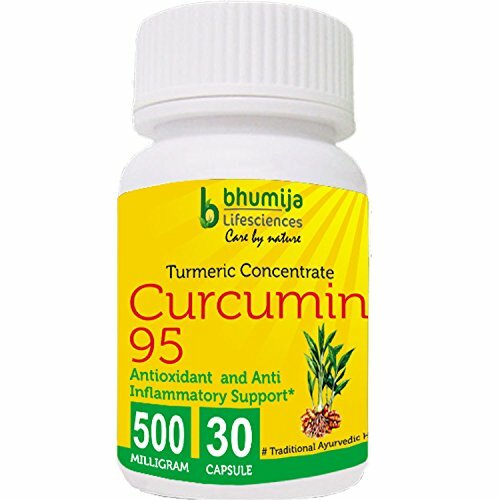 Bhumija’s CURCUMIN CAPSULES (CURCUMIN EXTRACT 95% – 30 Capsules/ Bottle – 500 mg per Capsule) Curcumin is the yellow pigment of turmeric valued for its many health benefits. Advanced technology to safely and effectively: Expert powerful antioxidant activity Supports joint health and function Promote heart and vascular health Curcumin 95 is a standardized extract of curcuminoid complex extracted from the South Indian spice turmeric (Curcuma longa Linn.). Research supports the wide-ranging health benefits of curcuminoids, especially curcumin, including antioxidant effects, modulation of the production of inflammatory signal molecules (prostanoids and leukotrienes), and inhibition of the growth of cells which have not properly differentiated or whose growth pattern is abnormal. Curcumin is also a key botanical extract in traditional Ayurvedic medicine. Curcumin is extracted from turmeric, an ancient spice that’s been used for centuries in pain relieving formulas. Turmeric contains antioxidants that help neutralize free radicals and strengthen the body’s natural defenses. Curcumin also has powerful anti-inflammatory qualities that reduce pain and help relieve stomach problems. BENEFITS OF CURCUMIN: Support the digestive system Boost immunity Helps rid the body of dangerous microorganisms and free radicals Helps relieve bodily aches (including headaches) and pains Promotes cardiovascular health Improves digestive health. Curcumin is the perfect supplement to stimulate the production of bile in the liver, encourage cleansing and improving the body’s ability to digest fats and excrete toxins. Curcumin used as a weight management tool, it has been proven effective in comparative studies with leading cholesterol medications. It boosts your burn rate, regulating your metabolism to reduce fat storage and giving you more energy to be active.